This map has everything. You've got a great ambiance, a wonderful layout, and JexJackl has a way of making the players do what he wants them to do using his map. 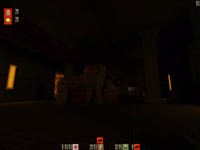 So I'm going to use JexJackl's Arachniphobia as an example of what makes a map great. Gameplay on this map is superb. I still find it hard to isolate a single aspect of this map but I shall try anyways. First, and foremost, multiple routes. JexJackl provides 3 entrances/exits to every base, and the complex between the two bases is very interconnected making route changes easy. A human killed near the spider base can't respawn and move to an intercept point on this map. It gives this map a very strong chaos property, which is a lot of fun in any mod. Arachniphobia also has an ample supply of stacking spots. Combined with a unique layout the stacking spots on this map can turn the entire game into an engy vs. breeder battle. The overall complexity of this map forces players to make great use of their communications. The team most likely to win here is the team most coordinated. There are also no advantages here, there is no ultimate stacking spot, no easily camped room, the whole map forces you to work at both offense and defense. There is no easy route to the win. There is nothing I would like to do more right now than continue this review. However, I believe this is already the longest review I have written for a gloom map. Heres what I want each and every one of you who reads this review to do: Scroll to the top of this page, click on the map poll link, look to see if arachniphobia is already cheched, if it isn't check it now, then click the "vote" button. You have now fulfilled your duties as a reader, continue back to the GMD homepage and browse as you see fit. "First you get the sugar. Then you get the money. Then you get the women." Comment: It's hard to say that it was the textures applications alone that made this map look so superb. Jex also used some good colored lighting to add to the feel and work in unison with the textures. Comment: I love this layout. Multiple routes, large rooms, long yet not-so-easily-camped halls. This layout has it all. Comment: Unique stacking spots, ceiling pipe routes, need I say more? This review has been read 1783 times. The Gloom Map Depository is copyright Team GMD. Quake2 is a registered trademark of Id Software. Gloom is copyright Team Reaction. The review script is copyright R1CH.